Rotator cuff injuries are widely known as the most common shoulder injuries. These injuries are especially common among regular gym visitors, who often underestimate the power of weights and the pressure that they put on the shoulders. The challenging workout programs and the repetitive motions above the head are a direct cause of the rotator cuff injury, which exhausts the shoulder and leads to shoulder stiffness, soreness, and immobility. Although they may sound terrifying, rotator cuff injuries are not that difficult to treat. There are several treatment options available, depending on the severity of the damage. For example, Dr. Tehrany’s extensive experience in shoulder surgeries has proven that the arthroscopic rotator cuff repair is an excellent solution for this condition. The arthroscopic rotator cuff repair is a simple surgery that allows the shoulder to fully heal within a span of a couple of months. 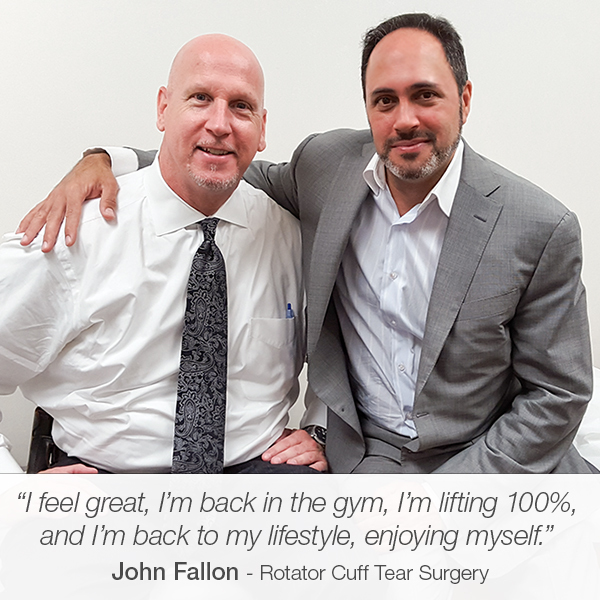 Last year, a patient named John Fallon visited Manhattan Orthopedic Care for a consult on his left shoulder. During John’s first visit, Dr. Tehrany diagnosed him with a rotator cuff injury. His condition developed as a result of a strict workout program, combined with playing football. Shortly after the consult, John was scheduled for an arthroscopic rotator cuff surgery. Dr. Tehrany and the MOC team thoroughly explained the surgery and covered all of the details of the post-op period. The staff did everything it could to make sure that John felt comfortable and at ease throughout the entire surgery process. Unfortunately, after Dr. Tehrany fixed John’s left shoulder, he required another rotator cuff surgery, this time on his right shoulder. A couple of weeks after the two surgeries, John began physical therapy for both of his shoulders. His mobility was back in no time, and he started enjoying his everyday lifestyle shortly thereafter. Now, six months later, John is absolutely thrilled with the results. His full range of motions is back, and he is completely pain-free. Feeling pleased with the outcome, John happily agreed to share his experience with Dr. Tehrany, and talk about the impeccable care that he received from him and the MOC team throughout the entire process. Hi, my name is John Fallon and I just want to talk a minute here about Dr. Tehrany and his staff in his office. Over the years I was a pretty active guy, I played a lot of football and worked out a lot. I realized that my shoulders were getting a kind of sore when I was having a tough time sleeping at night, as well as lifting my arms up above my head. So, I spoke to a friend of mine, who is a doctor and who happens to be a friend of Dr. Tehrany. He recommended him for a consultation. I came in and spoke to Dr. Tehrany, who is great. He explained everything very well to me in depth, and decided to move forward with having a rotator cuff surgery. On January 2nd, 2015, I had a rotator cuff surgery on my left shoulder. It was discovered that I also had a torn bicep, which Dr. Tehrany took care of, while I was in there. I started the rehab pretty much about two weeks after being in the sling, tow or three weeks maybe, under Dr. Tehrany’s guidance. He had recommended a great therapist, and I stuck with the plan as far as doing the rehab, which I think is one the most important things to do – follow through that and make a good, strong commitment to doing the rehab. This way you can get back quicker and you can get back to your lifestyle and what you wanted to do. During those three months that I was waiting, I also still had the problem in my right shoulder. So, again, speaking with Dr. Tehran, we decided to look at it, a little closer, and then move forward to having a rotator cuff surgery on my right shoulder. That was done on March 9th, 2015. At that point, Dr. Tehrany went in there and the surgery went very well. The damage wasn’t as bad as it was on my left shoulder. As he has told me during the consultation, that I would probably catch up from my right shoulder to my left shoulder in therapy, he was absolutely right. I did do that, and here I am today, on September 2nd, 2015. I feel great, I’m back in the gym, I’m lifting one hundred percent, and I’m back to my lifestyle, enjoying myself. I strongly recommend Dr. Tehrany and his staff here. I think they are doing an amazing job and I would recommend them to anyone. Thank you, John, for your amazing words. They give us the motivation to continue to provide the best orthopedic care for our patients.